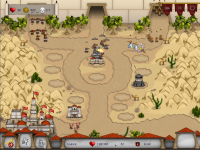 Rush on Rome released yesterday for iPad and Mac. Today we want to show you some new screenshots. After releasing the game on IPad and Mac yesterday we want to show you more screenshots from the game. These are two pictures of the gamelevels where you can see the third style. The game contains all together 30 playable levels (15 story levels and 15 challenges). We hope that the Windows version of the game can release on several platforms very soon. Here is our gameplay teaser which shows you the game. Yeah, maybe it is - there are towers you can build and then, there are the enemies which you are supposed to defeat running all over the place and stealing lives from you! On this level, the games may be 1:1 copies of each other. 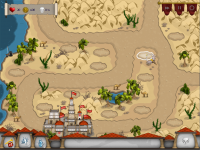 Then, there is Defense Grid, Orcs must die, and a lot more. But when you're playing this game, you'll see it's quite different. Personally, I'd say Rush on Rome is definitely nothing for the casual gamer (we've released it on bigfish games and got TERRIBLE feedback, go look for yourself) as the story missions itself are pretty challenging. But when you're a TD god, you'll only be satisfied when you've beaten all the challenge missions! Honestly, we've only built the story mode for those who like a little action from time to time but our heart was put into the challenges!